Why do we really have to stretch? Presumably to get ready for exercise and to decrease the chance of injury, but is there any scientific evidence to support this? Learn more. Growing up, my coaches always made me stretch before every basketball practice and game. We would try and stay interested, but it was really just a time killer until practice started. It became such a habit that before any pick-up game I would be on the side stretching a little to get ready. (I only hope that I didn't look like Woody Harrelson in White Men Can't Jump. At least I wasn't wearing the knee high socks). In the military every morning for PT (Physical Training) we would assemble, do a slow 15-20 second jog to warm up, and then start our stretching routine from head to toe. Granted, it did help me wake up because I was not, and am still not, a morning person. Why I joined a profession whose motto is "we do more before 9 a.m. than most people do all day" is beyond me. But why did we really have to stretch? Presumably to get ready for exercise and to decrease the chance of injury, but is there any scientific evidence to support this? Does pre-exercise stretching alone actually decrease the risk of injury? A study published in the Clinical Journal of Sport Medicine says it doesn't. Note: In the evidence that did show a benefit to the pre-exercise stretching routine it was almost always found to be accompanied with a warm-up before the stretching. (There was one study that found that stretching alone was associated with less groin/buttock problems in cyclists, but only in women). First: Immobilization, or "heating-induced increases in muscle compliance", caused tissues to rupture more easily. Second: Stretching before exercise would have no effect for activities in which excessive muscle length is not an issue (e.g., jogging). Third: Stretching won't affect muscle compliance during eccentric activity (where the muscle is contracting, and an external force is trying to lengthen the muscle: negative reps), when most strains are believed to occur. Fourth: Stretching can produce damage at the cytoskeleton level. The cytoskeleton is a dynamic structure which maintains cell shape, often protects cells, enables cellular motion, and plays important roles in both intracellular transport and cellular division. Fifth: Stretching appears to mask muscle pain in humans. Well, I like stretching before and after exercise to increase my flexibility. That's good, right? There is limited information about when to stretch during an exercise session at this time. There was a study conducted by the American College of Sports Medicine. Thirty (30) college age men and women participated (nine were highly trained, thirteen moderately trained and eight were sedentary) to see if the placement of static stretching, either before or after the workout, would effect flexibility in the hip, knee and ankle. There were no significant differences in any of the flexibility measurements except for hip flexibility which favored stretching after the workout. Now we cannot extrapolate from this information that it is the exact same for the flexibility of every joint within the human body but research of this type has not been conducted on every joint, so we have to presume some things when looking at the data. "I believe that you need to incorporate some static and ballistic type stretches into your routine from time to time." What Is The Best Warm-Up And Stretch? Warm-up techniques are mainly used to increase body temperature and are classified into 3 main categories: Passive, General, and Specific. Passive warm-up: increase in temperature by external means. This can be done with gels, packs, heating pads, saunas, etc. General warm-up: increase in temperature by nonspecific body movements. Swinging of your arms, bringing knees to your chest, jumping jacks, etc. Specific warm-up: increase in temperature using similar body parts that will be used in the subsequent, more strenuous movements. Out of these three, the best appears to be the specific warm-up because this method provides a rehearsal for the activity or event. This is why a few light sets of the exercise should be performed prior to each activity. Weight lifters have been utilizing this method for years. Throw in a few warm up sets of the lift you are doing prior to the exercise. One problem that leads to injuries with this is when lifters believe that doing a few warm ups of a specific body part will be all they need for the entire routine. I suggest doing two warm up lifts at each of the stations at the start of the body part you are working. If you are doing three chest exercises (Decline, Flat and Incline) you would only need two or three warm up lifts at the decline and one on the incline. Yes you are still utilizing the Pectoralis muscle, but the light set you do in that instance is not to warm up the muscle but to get the feeling of the lift to utilize the correct biomechanics for that lift. There are three basic categories of stretching activities: Ballistic, Static and PNF. Ballistic: makes use of repetitive bouncing movements. I would advise to stay away from this type of stretching because it may tighten up repeatedly and could overload the muscle. Static: stretches the muscle to the point of slight discomfort and is held for an extended period of time. Proprioceptive Neuromuscular Facilitation (PNF): uses alternating contractions and stretching of the muscles. There are other stretches out there, but I wanted to list a few of the main ones. There are also Dynamic, Active, Passive, and Isometric stretches as well. Depending on your training level you might use different ones interchangeably. Remember that as we age, what has worked for us in the past may or may not work for us in the future. Always reassess your stretching routine pre and post workouts to see if it meets your recovery needs. I use PNF stretches daily on my patients with excellent results. 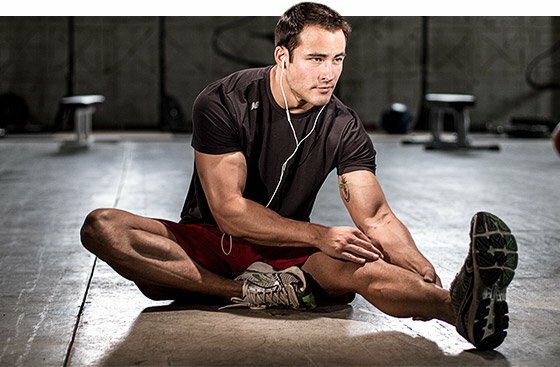 I believe that you need to incorporate some static and ballistic type stretches into your routine from time to time. This will make sure your muscles don't hit a plateau and you start to burn out. I am still researching as to which of the three is the most beneficial. So what is the conclusion and what should you do? The basic scientific literature suggests that stretching before exercise does not reduce the risk of injury and doesn't help with flexibility. When stretching did offer some benefit of risk prevention it was accompanied with a warm-up routine. In my opinion, the pre-exercise warm-up is far more important than the stretching routine, and it doesn't really matter where you place your stretching if your goal is to increase flexibility (except for the hip which favors post-exercise). Now, get up and go workout!